Andrei Salamandic (andreymd87) created T63814: blender2.8 crashing randomly. Andrei Salamandic (andreymd87) created T62609: confusing principled shading . Andrei Salamandic (andreymd87) added a comment to T62542: black artifacts. Andrei Salamandic (andreymd87) created T62542: black artifacts. Andrei Salamandic (andreymd87) added a comment to T62215: flipped normals in reflection plane. Andrei Salamandic (andreymd87) created T62215: flipped normals in reflection plane. Andrei Salamandic (andreymd87) added a comment to T62212: image editor tools missing. Andrei Salamandic (andreymd87) created T62212: image editor tools missing. Andrei Salamandic (andreymd87) created T61750: black normal maps eevee. Andrei Salamandic (andreymd87) added a comment to T61310: 2.8 crash material. 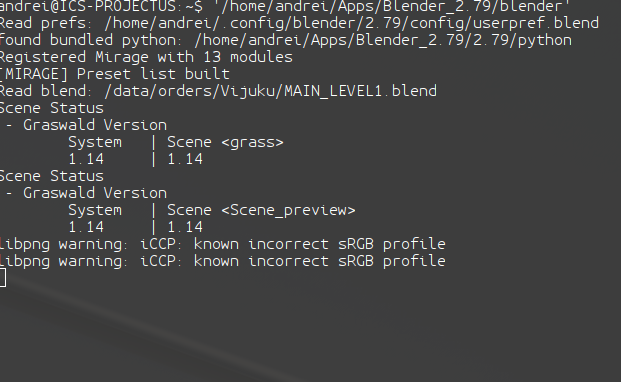 with the new blender-2.80.0-git.29922b6ff5f4-windows64 it now works fine. Andrei Salamandic (andreymd87) created T61310: 2.8 crash material. Andrei Salamandic (andreymd87) created T61282: denoiser blurs the textures. Andrei Salamandic (andreymd87) added a comment to T61250: limit texture size does nothing. this is not noticeable for objects because of viewport quality option. Andrei Salamandic (andreymd87) added a comment to T61246: lookDev HDRIs deleting wrong file. No. Multisampling and anisotropic works fine for me. Andrei Salamandic (andreymd87) added a comment to T61141: Append Particle Settings doesn't append the collection properly. confirm. the appended collection wich comes with appended particles settings disapears after saving the new created file. but, as a quick solution, in the new file we can create a collection especially for appended stuff. append the particles settings into it. set the particles to the object and change from appended collection to new created collection in render tab. Andrei Salamandic (andreymd87) created T61250: limit texture size does nothing. Andrei Salamandic (andreymd87) updated the task description for T61246: lookDev HDRIs deleting wrong file. Andrei Salamandic (andreymd87) created T61246: lookDev HDRIs deleting wrong file. Andrei Salamandic (andreymd87) added a comment to T61176: groups vs collection instances. i just ask if this is correct thing. Andrei Salamandic (andreymd87) created T61176: groups vs collection instances. Andrei Salamandic (andreymd87) added a comment to T60667: reflection plane bug in rendered view. EEVEE. works fine now. you are awesome !! here is. the suzane must be visible in the reflection plane. and she is, in an older build of blender. Andrei Salamandic (andreymd87) renamed T60667: reflection plane bug in rendered view. EEVEE from reflection cube bug in rendered view. EEVEE to reflection plane bug in rendered view. EEVEE. Andrei Salamandic (andreymd87) renamed T60667: reflection plane bug in rendered view. EEVEE from reflection cube bug in rendered view. to reflection cube bug in rendered view. EEVEE. Andrei Salamandic (andreymd87) created T60667: reflection plane bug in rendered view. EEVEE. Andrei Salamandic (andreymd87) added a comment to T58732: render result colors bug. Andrei Salamandic (andreymd87) created T58732: render result colors bug. Andrei Salamandic (andreymd87) added a comment to T58701: Node Wrangler add-on: viewer node bug. viewer node is that node wich comes from node wrangler addon. looks like the value is changing depending of the exposure in color management. if all are defaults the node gives value of 1 wich is the best for material preview shading mode. i think it should always be a constant value in this shading mode. Andrei Salamandic (andreymd87) created T58701: Node Wrangler add-on: viewer node bug.